It was 1853 before most of the world got its first glimpse of Japanese tattooing. 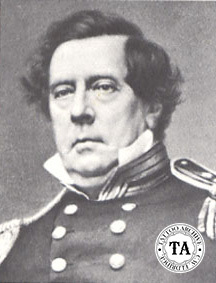 That was the year that Commodore Matthew Calbraith Perry of the United States Navy opened Japan to world trade. Japan had moved into isolation in the early 17th century when the shoguns ordered all foreigners expelled. Only the Dutch were allowed to keep a trading post in Nagasaki. America ships in Pacific waters needed coaling as well as refuge from typhoons, and America was always on the lookout for commercial expansion. President Millard Filmore sent Perry to open a dialog with Japan, using force only if attacked. When they roared into Kurihama Harbour (south of Tokyo), Perry fleet of "black ships" is said to have terrified the Japanese. When Perry's coal-burning ships appeared on the horizon, the Japanese thought they were on fire. "We found," one recalled,"that what we had taken for a conflagration was really the black smoke rising out of their smokestacks." The Commodore's East India Squadron at its peak included three steam frigates, three sailing sloops of war, one corvette and three store ships. Perry was especially proud of his flagship, the Susquehanna, a coal fired side-wheeler. Perry had pioneered the development of steam vessels for the Navy. Ironically in 1868, the new Imperial Government of Japan prohibited tattooing among the Japanese but allowed the tattooist to work on foreigners. Because of this law we have great accounts from ex-sailors, like George Burchett, on their visits to Japan while in the British Navy. In the 1880s Hori Chyo of Yokohama was the tattooist of choice and had a client list which included the future King George V of England, known then as the Duke of York, and Czar Nicholas II of Russia. 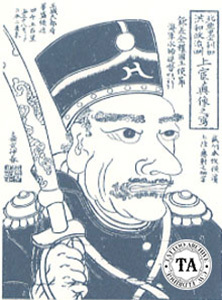 The Japanese influence on European, and later American tattooing is tremendous. Today traditional Japanese designs do not go out of style and wear well into the future. Many a tattooist has waxed poetic about the joys of Japanese tattooing, but George Burchett may have said it best, "Perhaps only an Oriental, with his patience and devotion, which is religious in character, could get so near perfection. I knew the Western tattooist, however skilled and gifted, were only imitators of an art which had been cultivated in Japan for 2000 years"